Hadoop is a distributed computing platform that provides a framework for storing and processing petabytes of data. Because it is Java-based, Hadoop runs on Linux, Windows, Solaris, BSD, and Mac OS X. Hadoop is widely used in organizations that demand a scalable, economical (read commodity hardware), efficent, and reliable platform for processing vast amounts of data. For storing such large amounts of data, Hadoop uses the Hadoop Distributed File System (HDFS). The master/slave architecture of HDFS is central to the way a Hadoop cluster functions. It supports one master server, called the NameNode, which manages the filesystem metadata, and many DataNodes that actually store the data. The NameNode is a potential single point of failure, so Hadoop also provides a Secondary NameNode that performs periodic checkpoints of the namespace and helps keep the size of the file that contains the log of HDFS modifications within certain limits at the NameNode. The project documentation provides a diagram of the architecture, while the HDFS User Guide gives a comprehensive introduction to HDFS from a user's perspective. Hadoop uses Google's MapReduce programming model for the distributed processing of data. In Hadoop's implementation, a JobTracker process on one node acts as the job scheduler and allocator for the cluster. It allocates jobs to TaskTrackers on each cluster node. JobTracker is a MapReduce master and TaskTracker is a MapReduce slave. Hadoop was originally built as infrastructure for the Nutch project, which crawls the Web and builds a search engine index for the crawled pages. Tasks that require carrying out the same processing on huge amounts of data are typically suited to be run on Hadoop. Hadoop supports three operating modes. By default, Hadoop is configured to run in non-distributed mode as a single Java process. 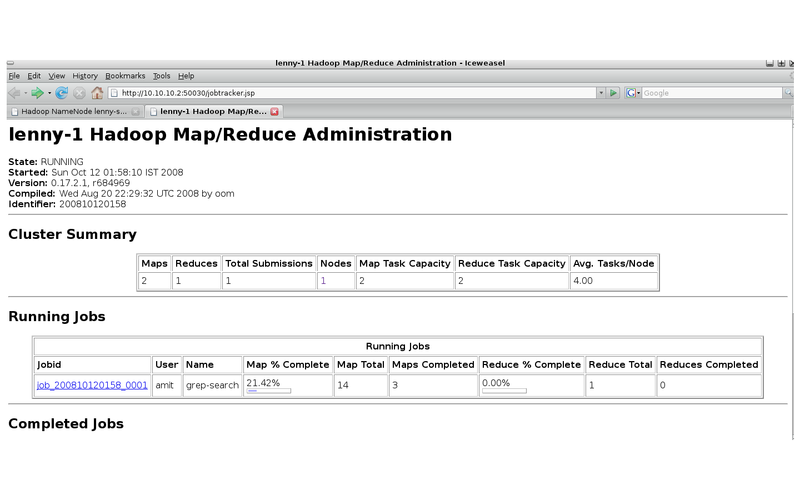 While that's useless for any real work, it helps you learn how to run Hadoop without setting up multiple boxes. You can also run it in pseudo-distributed mode, in which all the Hadoop daemons are run on a single node but each daemon is implemented as a separate Java process. In fully distributed mode, Hadoop runs on multiple nodes with distributed NameNode, JobTracker, DataNodes, and TaskTrackers. A minimum of three nodes is required to set up Hadoop in this mode. 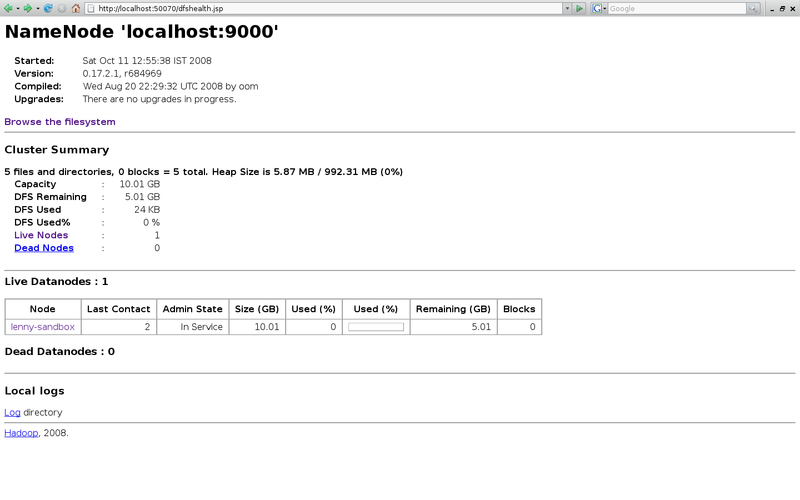 To test Hadoop, I set up a three-node cluster on three commodity Linux boxes, each running Debian "Lenny" beta 2, Sun JDK 1.6, and Hadoop 0.17.2.1. Other required software includes an SSH client and server running on all your nodes. In my test setup, I installed NameNode and JobTracker on two separate nodes, and DataNode and TaskTracker both on a third node. The conf/slaves files on the first two nodes contained the IP address of the third. All four daemons used the same conf/hadoop-site.xml file, specifically this one. For more information on what the various properties in the conf/hadoop-site.xml mean, refer to the online documentation. You must also set up passphraseless SSH between all the nodes. If you want to use hostnames to refer to the nodes, you must also edit the /etc/hosts file on each node to reflect the proper mapping between the hostnames and IP addresses. Once you have a Hadoop cluster running, you can see it in action by executing one of the example MapReduce Java class files bundled in hadoop-0.17.2.1-examples.jar. As an example, we'll try Grep (yes, with an initial capital letter), which extracts matching strings from text files and counts how many time they occurred. You can monitor Hadoop's HDFS and JobTrackers via bundled Web applications. You can view the HDFS administration panel at http://NameNode IPaddr:5070 (see screenshot) and view the currently running jobs and past history of jobs executed and failed at http://JobTracker IPaddr:50030 (see screenshot). Hadoop is known to work with 4,000 nodes, which hints at the scalability of Hadoop. Start small and scale up as you go, and let us know how you make out!